People Analytics 3.0 is about creating and deploying analytically-based products. Such products deliver value deeper into an organization than ever before. It still provides insights to those making the investments – business executives and HR leaders – yet it’s now also delivering value to those generating the data in the first place, namely workers. Examples include organizational network analysis (ONA), skill-mapping, career navigation, listening, engagement, and well-being tools, tools that provide more frequent, activity-based insights – that is, insights into what’s happening and what will likely happen based on analyzed activity in the present or over the recent past (e.g., days and weeks). This is very different than current norms: less confidence-inspiring insights asserting what “might” happen based on intermittent, back-reaching historical data (e.g., data within a HRMS or annual employee survey). Now, much is being written and discussed about how advanced analytical techniques can be applied in the talent/workforce domain, advancements in machine learning, artificial intelligence (AI), and natural language processing to name a few. This is all fine and good, but how these and other disciplines fit relative to the activities that have long been going on within organizations is important to clarify. These new techniques, tools, and data have, more often than not, been thrown into the ever-expanding and increasingly esoteric trough of “People Analytics.” The point here is to highlight the three big buckets that can be pulled from this trough so budget, resources, and energy can be allocated consciously and appropriately. And this is extremely important: The work of People Analytics 3.0 is different than that of 1.0 and 2.0. The skills are different. The people who do the work are different – they’re data scientists, software developers, ux designers, etc. The value propositions are also different, as are the tools used to create that value. If these distinctions aren’t appreciated and acted upon accordingly, then your organization will fall behind in the ever-accelerating race to attract great talent, deliver great work experiences, and maximize productivity, innovation, customer satisfaction, etc. It will also be ill-prepared to appropriately respond to business and market transformations. Ok, fine. Makes some sense. If you’re speaking about 3.0, though, what the heck is 1.0 and 2.0? Glad you asked. People Analytics 1.0 is what most people think about when they first hear the term "People Analytics" in academia or business. It’s research. It’s a study. It could be an experiment. It’s a project meant to discover insight into certain dynamics: personal, inter-personal, or relating to teams, groups, or organizations. Such work has been going on for a very long time, over one hundred years depending on how you define it. It’s the domain of professional researchers: I/O Psychologists, Anthropologists, Economists, Statisticians, Modelers, Scenario Planners, etc. (By the way: I’m using the term “People Analytics” as a proxy for everything remotely synonymous: Workforce/Talent/HR Analytics. Debating differences among these is rarely a good use of time, and it’s certainly not in this context). People Analytics 2.0 is the aggregation, staging (cleaning), visualization, distribution, and analysis of formerly disparate data sets. Simply put, PA 1.0 involves aggregating data on an event-driven basis, most often for a well-defined, time-bound, group-specific research study. In PA 2.0, on the other hand, data are continuously available, via a tool, to a wider audience than just the analyst or research team. So, given its nature, this work is most often done by professionals with backgrounds in IT, HRIS, data warehousing, data architecture, data visualization, etc. It is a direct descendent of the business intelligence industry, and has been maturing over the past 20 years, particularly the last 10. To appreciate how PA 2.0 has progressed over the years, a quick story: When I worked in this field in the early-to-mid 2000’s we were able to aggregate and “stage” data from disparate systems once per quarter, and each quarter it took roughly 21 business days before it was published and made available to internal analysts and the HR business partner community (three weeks!). How popular were the “insights” when we made them available, sometimes four months after the data was first produced? Not very, of course. How popular are similar insights now? Very. Why? Because data are now published monthly, weekly, and sometimes daily. The refresh cycle that once took 21 days now only takes a day or two and, in some cases, depending on the data sets, capturing technologies, process integrity, analytical technologies, and a handful of other factors, such data can now be made available in real-time, or close to it – immeasurably better than once per quarter. Of course, this represents a HUGE achievement, yet it’s only taken us so far. Insights still have a limited audience, and the integrity, thus usability, of the underlying data still gets called into question. Why? Because the data are most often transactional, infrequent, and relatively distant from the dynamic being investigated (see Performance Management is Stupid as an example). A very important point to note right here: This is NOT a progression or maturity model. Any modern People Analytics capability will be doing all three via an ecosystem of data, tools, people, and partners. All are important. All have their unique purpose. All will endure over time. That said, they are not equal in terms of the investment needed or the value that’ll be extracted. Unsurprisingly, the greatest investment, risk, and opportunity lies in PA 3.0. Ok. All right. I see some distinctions, yet to date our business has done pretty well without 3.0, so if it’s a high investment, relatively high risk, etc. why should we do it now? After all, we’re still not all that good and what you’re describing as 1.0 and 2.0. More great questions. Thank you. Let’s be quick and clear: People Analytics 1.0 and 2.0 will never be complete, nor will they go away. With 1.0 there will always be new studies to do, new experiments to run, new dynamics to explore. Similarly, with 2.0, there will always be data to clean, more data to add, more systems to integrate, more reports to run, more visualizations to create. Considering this reality, where is your organization investing? WHERE IS YOUR ORGANIZATION SPENDING ITS TIME, MONEY, & ENERGY? WHERE SHOULD IT BE? If the mindset is “We’re not there yet” because 1.0 and 2.0 haven’t been done well enough (if at all) then, as mentioned, your organization will lose the competition to attract, retain, enable, and inspire great talent, plain and simple. The world is moving too fast and workers now have an increasing, and warranted, expectation that the data they generate, and insights that stem from such data, be used to benefit them too, not just the organization. It’s already happening in certain businesses and educational institutions. As such, if your organization is only investing in legacy processes (1.0 and 2.0) and forgoing the opportunities that lie in 3.0, then there will be real and lasting costs, both in terms of suboptimal worker behavior and organizational performance. Pretty strong assertion there. What’s justifies it? Damn you ask great questions! Again, to be quick and clear: People Analytics 3.0 came into being because of disruptions in the marketplace, disruptions relating to the digitization of work, business transformations, open talent economy, as well as the emergence of more data and better technologies in which to create, capture, analyze, visualize, and/or distribute insights – think of your daily activity on your phone and the data you generate publicly, privately, to the app providers, and for the organizations with which you work. Much of this data was, up until just a few years ago, largely unharnessed, lacked context, meaning, and actionability, thus was viewed as a “nice-to-have.” Now the data are being corralled, given meaning, and the insights produced are now arguably “must-haves” for planning and leading businesses in the 21st century. For the record: My admittedly biased opinion regards 3.0 as a must-have. Why? Because those leading business transformations are now looking at an expanded array of ways work can be done, everything from leveraging outsource providers, contractors and consultants (gig economy/liquid workforce), to start-up partnerships, automation, and AI. No longer is the model to hire employees and have them do nearly all the work an organization needs done. As such, we as People Analytics professionals need to understand how these shifts will affect the work experience (e.g., skills needed for the future) and how we can contribute to strategy formulation around business transformation, not merely be a reactionary stakeholder of such strategies. After all, we should be extremely credible partners in helping make decisions regarding location, recruiting, hiring, skill development, communication, partnering, org structure, etc. An example would be creating an analytically-based product that would help assess and develop talent among acquired and/or partner organizations. The insights derived from such a product would shed light into the skills the organization has relative to what it envisions it needs over time. This would then inform training investment, hiring priorities, on-boarding activities, internal mobility, diversity initiatives, etc. Also, if done intelligently, it would also empower workers to develop themselves in line with their own intentions as well as the needs of the organization, thus elevating their value and ongoing employability. OK. I get it, but we have limited budget, and HR, and People Analytics specifically, isn’t closely connected to those leading business transformation. So where to start? First, understand where you are, where you want to go, and how you’re going to get there. This doesn’t have to be a rock solid step-by-step plan. It does, however, have to be specific and thoughtful enough to align formerly disparate people, activities, and investments. The world is obviously becoming more interconnected, thus our internal processes, too, must become more interconnected. This means the vision and roadmap needs to be co-created with leaders from IT, Finance, Operations, Legal, Facilities, and, of course, Business Transformation; and these individuals are likely already convening under the auspices of a digital or business transformation initiative. As such, either join that initiative as a value-adding partner or create your own governance body – formal or informal – to help set priorities, command resources, and, as important as anything, implement and make change. As a discipline, we can no longer be “Waiting for Godot” and hope a wise leader says this is what we need to do. The reality is that most HR and business leaders don’t know what’s possible in People Analytics in 2018 and beyond. It’s our job to understand what’s possible, package it, communicate it, and integrate what gets prioritized into the appropriate change or transformation initiative. 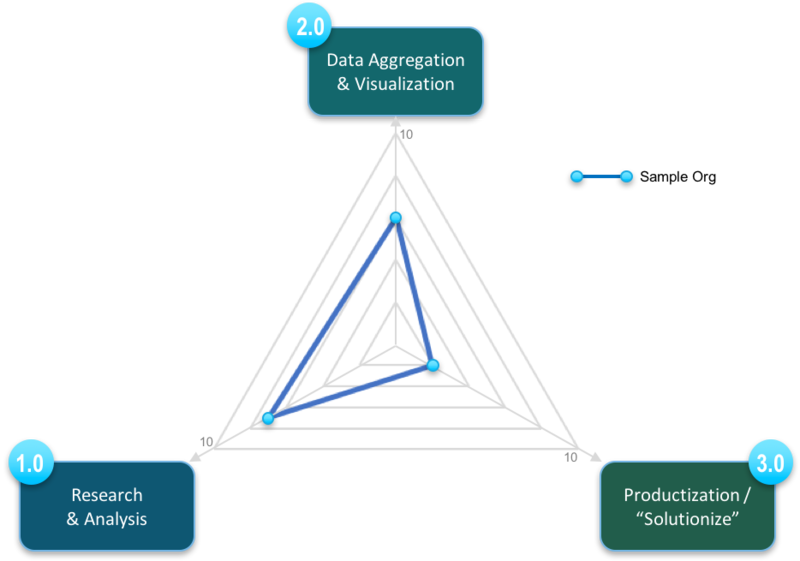 To help with this, the graphic below places People Analytics 1.0, 2.0, and 3.0 within the Analytics Maturity ProgressionTM. Note again that organizations should embrace the “and,” not think of these as an “or." There are different needs being filled and different people, processes, tools, and data involved. Will there be overlap at times? Yes, of course. Even so, it’s unfair to ask an I/O Psychologist to build an analytically-based software product like it’s also unfair to have a machine learning specialist design and execute a behavioral-based research study. These are different people doing different things. If all are important, then hiring and partnering appropriately is a must. OK. The points are pretty clear, but our organization has been using a maturity model and this progression and the three distinctions don’t align so well. What to do? In nearly all cases, the linear or parabolic progression from basic to advanced to more advanced – from descriptive, to predictive, to prescriptive, for example – is inappropriate. Such models perpetuate a mindset and approach that suggests you do one before you get to do the other. I don’t agree with this thinking. Instead, do what’s most appropriate given the business or human need. This is what I see when working within leading practice companies: I observe them doing what’s most appropriate. This might mean doing PA 3.0 right out of the gate (yes, it’s possible, particularly in 2018 and beyond). It compares to building the next generation mobile device as opposed to attempting to replicate a rotary dial phone of days long gone – which, frankly, is what most organizations are doing without even knowing it. They’re largely automating reporting processes as opposed to driving new candidate and employee experiences, work strategies, etc. They’re thus holding themselves back, and they’re unknowingly holding back the discipline itself. This must change. Ok. I’m done. I’m now officially anxious and wondering if we’ll ever get this right. Any suggestions to relieve my angst? As opposed to looking at what hasn’t been done or what isn’t possible, please identify and celebrate what can be leveraged. After all, if you’re at this point in the article you're obviously curious and care about the People Analytics discipline and how it’ll impact the future of work, work design, and people planning. Thank you. We share this professional interest and, hopefully, passion. So here’s the deal as we start to wrap up: Historically People Analytics has been commissioned by leaders to better understand how they can best optimize employee productivity, innovation, customer satisfaction, sales, profitability, or some other business outcome. It’s been about efficiency and effectiveness: “Am I, as an executive, using my budget (payroll, bonuses, benefits, training, employee perks, etc.) wisely to achieve desired outcomes?” All fine and good, yet this has been done with an organization-first mindset, with little regard to people’s humanity apart from their role in achieving those outcomes. The human benefit had often emerged as a fortunate externality at best, to an unwelcome accident at worst (because it might have to be maintained or even invested in over time). Now, however, this is fundamentally shifting, and it’s shifting for good. People Analytics 3.0 is helping humanize the corporate experience. As it does, it provides incentive (both conscious and unconscious) for workers to provide better data (more accurate, frequent, specific, etc.). Better data means better insights. Better insights means better decisions: risk is reduced and the likelihood desired outcomes are achieved elevates beyond where it would have been otherwise. All great things. Essential first steps to deliver on the promise of People Analytics 3.0 involves new ways of thinking, communicating, and making decisions. No longer is People Analytics an HR initiative – conjured up by HR, sold by HR, done by HR, and delivered by HR. It’s now, without exception, a multi-disciplinary initiative involving, at the very least IT, Operations, and Legal, yet ideally also involving Finance, Procurement, Facilities, Business Transformation, and other relevant functions. HR can, and arguably should, take the facilitator role, as it’s uniquely qualified to do so; and facilitation is what’s called for (not ownership). Given that digital transformation (IT) affects how work gets done (Operations) which, in turn, affects the employee experience (HR), the need for systematic thinking and decision-making is essential; and all this put together greatly influences, if not just simply is, an organization’s culture. As such, the responsibility of realizing the promise of People Measurement, Analytics, and Strategy lies with the Executive Leadership Team if not the Chief Executive Officer him or her-self. We in HR, and in the People Analytics profession specifically, thus have what’s sure to be a fleeting opportunity to create a compelling vision for people measurement and analytics in our organizations; and, for my money, elevating the awareness of 3.0 as a distinct discipline within the People Analytics realm will help clarify the trade-offs of focusing on one area over another. 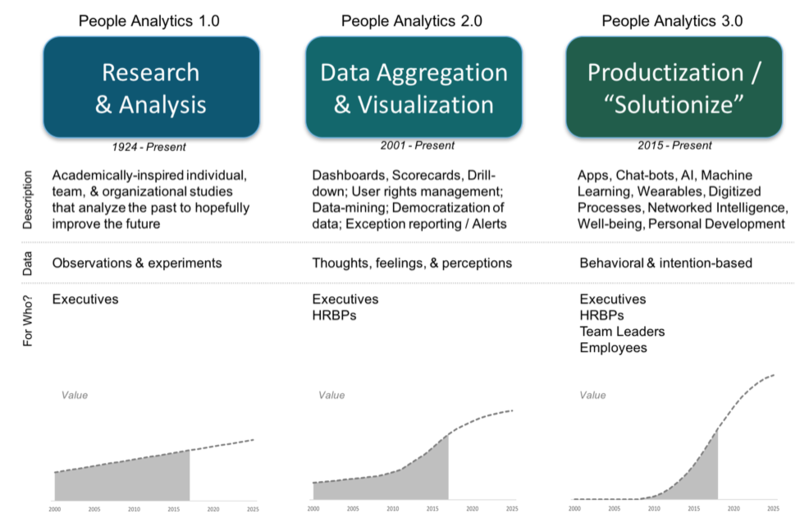 In the end, People Analytics 1.0, 2.0, and 3.0 will have to be optimized over time. Understanding the unique limitations and opportunities within each will help consciously create culture and drive business performance like never before. The opportunity is here. It’s now just a matter if we realize it or not. I hope so, for all our benefit. Please live consciously, and to making great things happen! Al Adamsen is a globally recognized thought leader, speaker, and advisor on talent strategy, people analytics, workforce planning, business transformation, and simply how people measurement and analytics affects worker experiences and organizational culture. He’s the Founder & Executive Director of the Talent Strategy Institute, Global People Analytics Network, People Analytics & Future of Work Conference, as well as a co-founder of Insight222. He lives with his family in Santa Cruz, CA and can often be found on the areas beach volleyball courts.